Across the country, our chapters are doing amazing work. As each chapter has a unique relationship with their dining provider and partner agency, all our chapters have their own narratives to reflect on their experiences with FRN. We are so happy to celebrate our chapters by sharing their stories and recognizing them for their hard work. Follow the #FRNSpeaks hashtag to keep up with what our chapters are doing! Hi fellow FRNds! I’m Zeel, like banana peel with a “Z”, from the University of Houston! I’m currently pursuing a degree in Public Health with a minor in Biology, and (hopefully) graduating in May 2018. I am taking a year off after graduation to work and “adult” for a little while, and then applying to law school! In the past few years, outside of FRN, I’ve been involved in Student Government, my University’s Housing department, and volunteering at Houston’s animal shelter and children’s hospital! If you’ve ever been to a farmers market, the first thing you might notice is a sense of connection between the products and the people there. You might see how eager each farmer is to talk to you about what they’re selling, because most of the time they grew it or made it themselves. If you’ve ever eaten a vegetable that was harvested that day, or bitten into an apple that came from the orchard down the street, you might notice how much better it tastes. This taste is not just physical. An entirely new eating experience comes from knowing the food is not only good for you, but good for the person you bought it from and good for the environment in which it grew. This is something I came to understand over the course of my first semester as a student at the University of Michigan and a member of the Food Recovery Network (FRN). My name is Rachel Cohen and I’m a junior Energy and Environmental Policy major at the University of Delaware. At UD, I’m involved in the Blue Hen Leadership Program, a four tiered leadership program aiming to build students’ leadership skills and encourage opportunities to engage in community service. It was through BHLP that I was able to get to know junior Public Health major Jaime Renman when she led a group of my peers and myself on a spring break trip to Baltimore, Maryland. I joined my chapter when I saw the table at the involvement fair my first year, and knew that FRN was right for me. I was involved in Campus Kitchen, a similar organization to FRN, in high school and FRN reminded me of the work I did then. I went to every meeting, and soon enough, the executive board started giving me tasks to work on. They must have seen something good in me because shortly after, they asked if I wanted to join the executive board. The rest is history. I started as an executive board member first semester my first year all the way to the end of sophomore year. When our presidents graduated, I took over this year as our club president. “Don’t just learn. Engage.” The motto of Lawrence University in Appleton, Wisconsin, is certainly an apt description of what the students involved in the school’s Food Recovery Network chapter do every day. Education and engagement stretch beyond the boundaries of the campus to include some thirty cities, towns, and villages in three counties of northeastern Wisconsin, known as the Fox Cities Valley. 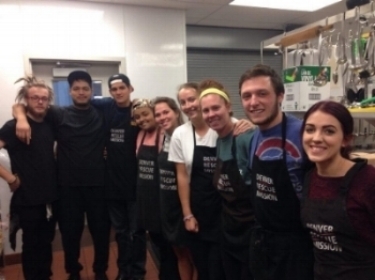 What a single Food Recovery Network chapter can do is limitless, as the Goucher College Chapter in Baltimore, MD demonstrates on a weekly basis. Under the direction of Micah Heaney (in partnership with Norman Zwagil, Food Manager at Bon Appetit Management Company), the chapter is making solid contributions to campus life. What a huge issue surplus food is in our country, but how simple the solution can be! In Denver, the solution started with the ideas and efforts of Paul Sherman, a senior at the University of Denver (DU). Paul has built a three-prong partnership between the DU Food Recovery Network (FRN) chapter, Sodexo; the national food service that provides meals in the university’s cafeterias, and the Denver Rescue Mission, whose Lawrence Street Shelter provides food for 1700 individuals, three times every day of the year. Northfield, Minnesota is home to the outstanding Food Recovery Network (FRN) chapter at Carleton College.The chapter has seen tremendous growth since its founding in 2013; since then, the number of partner organizations has grown from one to five, and the number of food rescues went from one per week in one dining hall to two per day in two dining halls. Senior Hailey Purves has made real progress leading the Food Recovery Network chapter she founded at the University of South Dakota, FRN’s first ever chapter in South Dakota, this past school year (2016-17). With the help of a few fellow students, she has established a strong working relationship with both the university’s dynamic food service provider, Aramark, and a remarkable non-profit partner agency, Welcome Table. All of our FRN chapter leaders fit the maxim, “If you want to get something done, ask the busy person.” Jenny Park, president of the University of Hawaii at Manoa chapter, is no exception. One would imagine Jenny heading for one of Hawaii’s beautiful beaches during her recent spring break. No, far from it.